The general secretary of the Taxi Driver’s Union of Othón P. Blanco (Sindicato Unico de Choferes de Automóviles de Alquiler: SUCHAA), Sergio Cetina Valle, presented on Sunday May 13 their electronic platform for passenger transport service which, he said, unlike others such as UBER, does have a fully legal concession. The presentation took place during the ordinary general assembly of members of the SUCHAA, at 10 in the morning. He assured that this electronic platform will strengthen and grant a “plus” to the taxi service in Chetumal and the south zone of the State because, unlike UBER, it works under a legal framework. Cetina said that this alternative grants great benefits to the users, because the vehicles that work under this modality will be obliged to have GPS tracking units. The application will have a cost of 2,500 pesos, which is accessible to the concession partners, while the passenger will pay an additional figure to the rate. 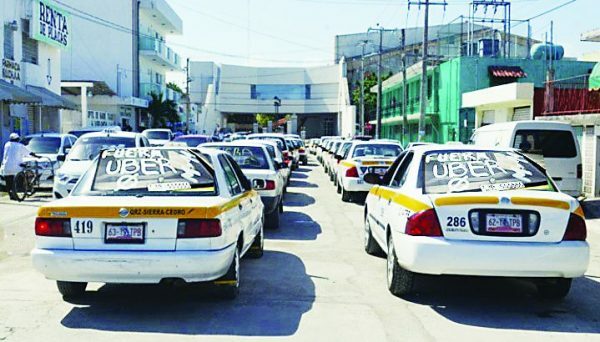 He stressed that in this way they modernize the taxi service for the benefit of users in the south, particularly Chetumal, and of course, they are at the forefront regarding the use of new technologies. It is estimated that the digital application will be in use before the end of this month. The leader of SUCHAA stated that security is a priority issue, and that this new system will allow them to keep track of each and every one of the units that are registered as taxis.